With their low price, versatile installation options and large size; banners are one of the most economical and effective ways to advertise. Our wide format printer can print banners up to 5 feet tall in full color. Hemming and grommets are standard but we also offer special services such as wind gussets, pole pocketing and substrate mounting. 13 oz Aspire matte – Standard 13 oz single side banner material intended for reusable banners. Most banners are printed with this stock. Usually hemmed and grommeted. Sewn hems and pole pockets are available options. 8 oz ultraflex superprint matte – Light-weight single side print economy banner material intended for short term use. Usual application is unhemmed, corner fold grommeted banners for one day event signage. Also used when total banner weight is a concern. 15 oz Aspire 2 Sided matte – Heavy duty banner material with printable coatings on both sides. Also has light blockout properties. Primarily used for pole banners. 8 mil Aspire smooth banner – indoor use only. 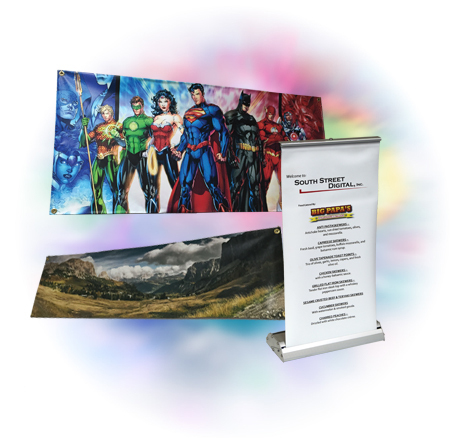 Super smooth polypropylene material designed not to curl when used with retractible banner stands. Does not need to be hemmed. Not recommended for exposed outdoor use since it lacks the reinforcing scrim of the other banners. Most banner materials are available in gloss, but gloss performs poorly in bright conditions. The glare can make the banner almost unreadable. Specialty banner materials such as mesh, smooth, backlit, double sided and light blockout material are available. We also offer banner stands assembled with 8oz smooth banner. This also includes the option of a free standing retractable banner in 6 foot tall or table top size. Additional banners for the stands can be ordered and installed.